Durable glass surface will not stain or ghost for clean erase after every use. 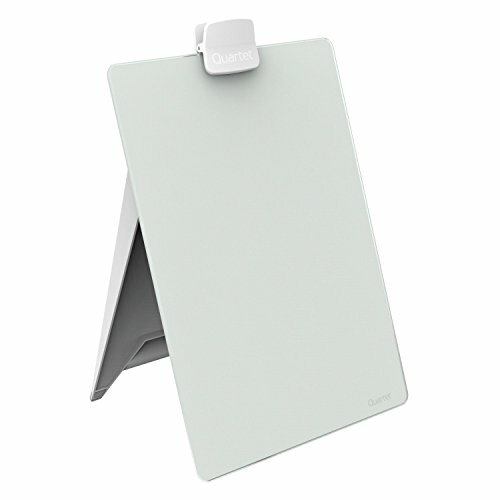 White glass dry-erase desktop easel is infinitely reusable and replaces the need for scrap paper. Frameless design is sleek and attractive. 9" x 11" board size conserves usable desktop space. Position easel upright to keep notes in view while you work. When collapsed the board is not completely flat but angled upward to make writing easier. Clipboard-style design allows dry-erase desktop easel to double as a copy holder for letter or A4 size papers. Back of easel has a built-in storage slot to hold standard size sticky notes. One Quartet dry-erase marker with a cap-mounted eraser is included, along with a clip on the back of the board to store the marker.